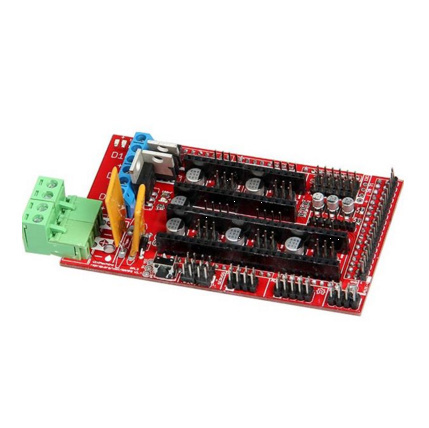 RAMPS - RepRap Arduino Mega Pololu Shield board. This is version 1.4 of the shield, designed to drive a RepRap from an Arduino Mega. It uses Pololu Stepper Drivers delivering up to 1/16 microstepping. Four drivers are needed to move most 3D printers, with 3 going to the axis & one driving the extruder. An optional fifth stepper driver socket has been provided for additional applications. Heated bed control with 11A fuse. 5 Pololu Stepper Driver sockets. Arduino MEGA and Pololu Stepper Drivers easily removable for reuse at RAMPS end of life.